50+ page PDF now available! Swedish Drill Revisited is a complete open-and-go curriculum that will assist you in instructing your children two complete Swedish Drill routines. In addition, it will equip you with the information you need to develop new routines once your children have mastered those included in the manual. This product is entirely self-contained and has everything you need to make Swedish Drill happen consistently in your homeschool or co-op. The majority of the content in this manual is available to you free of charge in blog posts here on Afterthoughts. There is some new content added in terms of history and background, but there is only one exercise in this manual that is an addition to those already shared on this blog. What is the value of this manual, then? It organizes the information into one convenient location and makes the video of each exercise a mere click away. In using the manual you will find images of what the movement should (and should not!) look like paired with the instructions to give your child for each particular exercise. In addition, you will find tips for teaching and an image that makes referencing the correct video hosted on Afterthoughts a single click away. This will be particularly useful for those who desire to use the manual directly on your tablet rather than printing it out. In these pages you can view the Table of Contents, a page of text, and a page of instructions complete with pictures and links. I hope this will help you decide whether or not this product is a good fit for your family. Click here to download and view the sample pages. What age range is this curriculum for? While most of the movements in this manual can be safely performed at any age, formal instruction in Swedish Drill should not begin prior to the age of 6 years old. Even at age 6 some children may not be physically able to perform some of the movements due to them requiring a greater degree of coordination and body awareness than is possible at that age. However, all exercises in the manual are within reach of children 8 years of age and older assuming normal neurological and musculoskeletal function. Is there a hard copy available? No. There are currently no plans to make this available as a hard copy product. May I use Swedish Drill Revisited with my homeschool Co-op? Yes! Swedish Drill is particularly effective in a co-op setting. Please note, though, that purchasing the manual only grants you a single-family license. For best results Swedish Drill must be practiced at home, and families would benefit to having instructions available to them to ensure that the same commands are given and expectations set for how the movement should be performed. Co-op pricing is available as noted above. 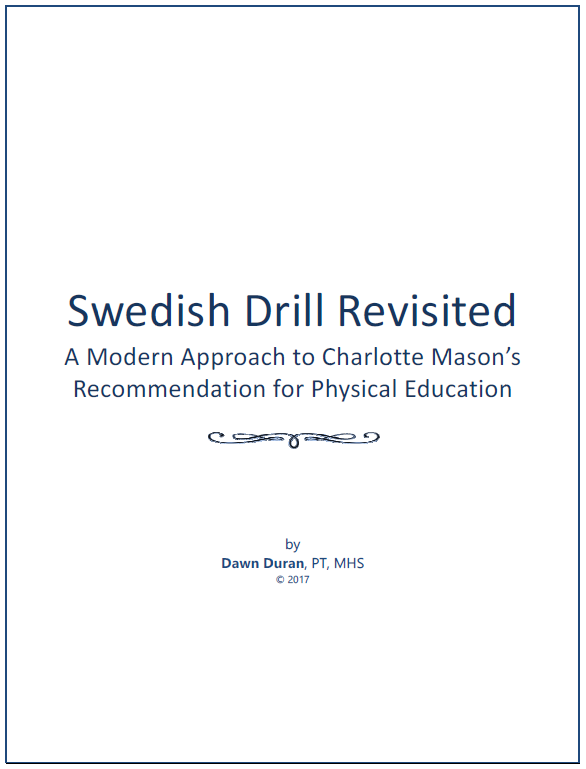 Is Swedish Drill Revisited just for Charlotte Mason home educators? While Swedish Drill as a form of P.E. (physical education) is well-known among Charlotte Mason homeschoolers due to Charlotte Mason’s praise of it in her six-volume educational series, it is lesser known outside of Charlotte Mason circles. However, I believe that the movements contained in Swedish Drill are of great value to all school-age children in order to counteract the negative impact that sitting at a desk and completing school work has on bodies that were designed to move. Swedish Drill cultivates the habits of attention, observation and perfect execution while physically training the body to demonstrate proper alignment. Swedish Drill also promotes coordination, flexibility, body awareness and core strength, and as such is an excellent option for homeschool P.E.